These luxury raised dog feeders are perfect for taller or shorter dogs. Handmade to order for us here in the UK, some of our raised dog feeders can be painted in any bespoke paint colour to match the decor of your home. 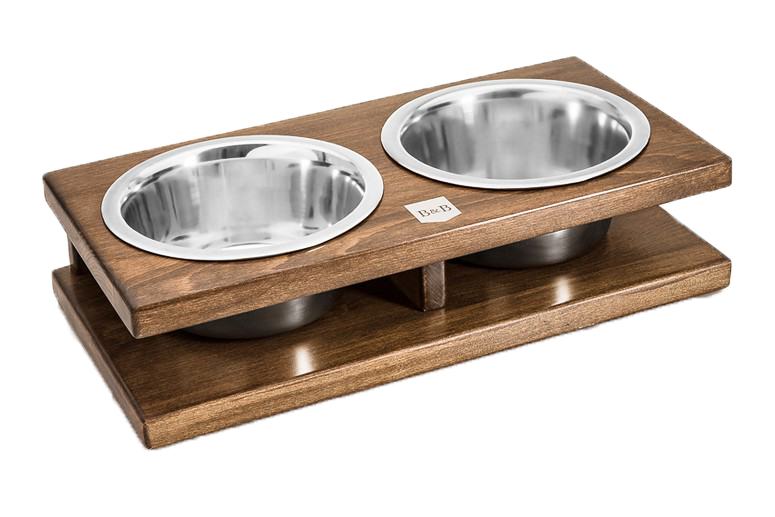 There are a range of heights for you to choose from so that your dog can eat and drink in optimum comfort. We also have very chic raised dog bowls by Bowl and Bone. There is much controversy around whether a raised dog bowl is beneficial or harmful for dogs. Dogs should eat in a standing position with their neck bent downwards when eating. For most dogs, a raised dog feeder is not necessary and can be harmful to the dog as when eating with their head raised, they can inhale too much air along with the food and this can cause many problems including choking. However, for our long-legged dogs such as Great Danes, Whippets and Greyhounds, a raised dog feeder is ideal. A raised dog feeder is also great for older dogs or dogs who have stiff joints or arthritis and find it difficult to move their necks easily. At Chelsea Dogs, we have some unique dog feeders made from the finest wine boxes imported straight from the vineyards in France. We also offer a range of metal dog feeders which are all handmade to order in the UK for us and they can be painted in any colour you like to match your home décor or to stand out as a decorative accessory. Treat your prince or princess to one of our luxury raised dog feeders which all come with dishwasher safe, removable stainless steel bowls.